As new mobile payment models come online, and more sectors embrace mobile as the primary channel for customer engagement and transaction, the report reveals nine significant mobile money trends and explores how they are stimulating growth across the expanded mobile ecosystem. The report, based on a study of 15,000 mobile media users across 15 countries, shows that mobile banking continues to engage consumers – especially in mobile first markets. 69% of mobile media users globally carried out a banking activity via mobile in 2015, up 3% year-on-year; In Indonesia the figure was 80%, in Nigeria 85% and Kenya an incredible 93%. E-commerce via mobile is also gaining traction, particularly in mature markets. 43% have bought a product on their mobile either by using a credit or debit card, an online payment service or a retailer’s branded scheme. In the US, 29% have inputed debit or credit card information into their device to make a payment versus the global average of 18%. In the UK meanwhile, 15% have used a retailer’s online payment service – the global average is just 9%. By contrast, the study found that uptake of proximity payments was still in its infancy. Only 20% have used a mobile wallet, plug & pay device or mobile loyalty scheme which shows consumers are not yet convinced by mobile wallets. A third of people either haven’t heard of them (18%) or don’t see the point (15%). Social media emerges as a key opportunity for mobile payments, especially in growth markets where feature phones are still dominant. A quarter (25%) of feature phone users say that a social media page is their number one destination for mobile commerce ahead of 15% of smartphone users. Second screening is also having an impact. Of the 94% of mobile media users who use another form of media while browsing on their phones, 14% said they use their mobile device for ‘shopping or commerce’ whilst 32% say they search for information about the content they’re engaging with. However, trust – or rather a lack of it – remains the single largest obstacle to growth. 34% of people named it as the reason why they don’t carry out more transactions on their phone – far outweighing other concerns like bandwidth and network speed. This increases to 36% when it comes to mobile wallets. MEF’s CEO Rimma Perelmuter commented: “There is no doubt that consumers are embracing mobile money. It’s a booming space and MEF’s annual study identifies the key drivers of social media, messaging apps and second screening underpinning its remarkable growth. 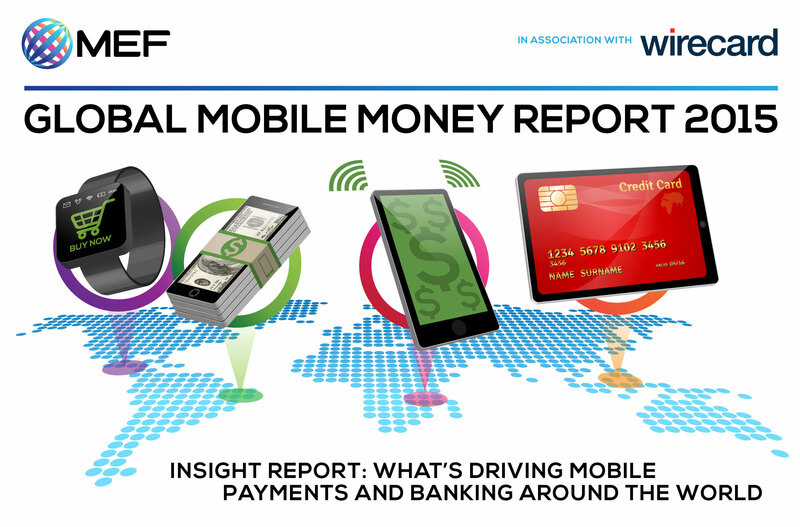 Download the full MEF Global Mobile Money Report 2015 free-of-charge – leave your details above.